Storybook Saturday: Happy Birthday, Dr. Seuss! Bring your family to the Storybook Capital of America for a fun, Seuss-filled day in downtown Abilene! Register your family to attend a Storybook Saturday event celebrating the birthday of Dr. Seuss and Read Across America! The fun starts at 10 a.m. at Everman Park. Create Seuss-themed art from a variety of books, meet costumed characters, have your face painted, play with bubbles and ride the train (extra fee). A Seuss-themed Little Free Library will be dedicated at 11 a.m. Space is limited for this event. Registration is required. The cost is $5 per family. Train rides on the Storybook Capital Express through Everman Park, where six Dr. Seuss sculptures are located, are $1 a person. Please limit train rides to one adult per family. 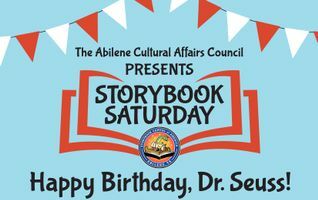 Storybook Saturday is a program of the Abilene Cultural Affairs Council in partnership with local arts and community organizations. Other Seuss activities taking place Saturday downtown include "Tea with the Grinch" at the National Center for Children's Illustrated Literature (NCCIL) from 1 to 4 p.m. and Seuss Storytime and Crafts at the Abilene Public Library from 1 to 3 p.m. Both events are free.